For the last few years, the Sole E95 elliptical trainer has been an excellent value, offering $2,000 plus quality for a lot less. The new version, the Sole E95 for 2013 carries on that tradition. The Sole E95 (2013 Model) is built around a heavy 29 lbs flywheel and uses 4 rear wheels rather than the commonly used 2, which ensures a stable, smooth and quiet operation even with the maximum user weight of 400lbs. 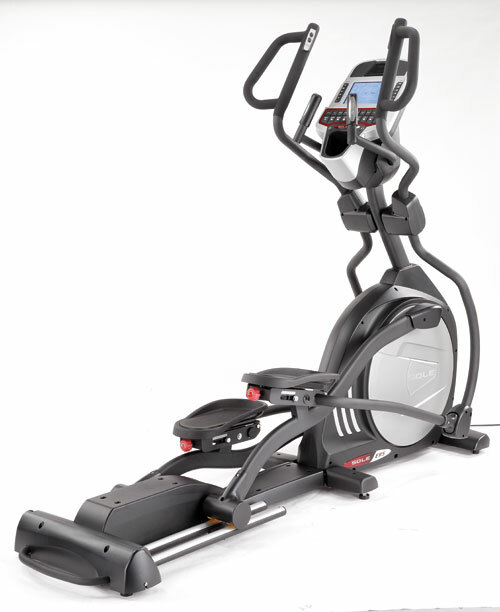 The foot pedals on the Sole E95 elliptical trainer are not only large and cushioned, but also employ Sole’s unique articulating system that allows the user to adjust the angle of the footpad for maximum comfort. The incline of the Sole E95 elliptical trainer can be adjusted with the push of a button from level to a very steep 40pct, greatly expanding the range and intensity of your workout. 10 workout programs, including 2 heart rate and 2 custom provide enough training variety and the Sole E95 (2013 Model) also has built-in music docking station with speakers, cooling fan and dual heart rate monitoring, contact grips or chest strap. Warranty of course is as good as you will find on any machine, lifetime on the frame, 5 years electronics and parts and 2 years on labor. If you are looking for a top of line elliptical trainer, you can easily pay over $2,000 or you can get the Sole E95 and save money in the process.